Glue each swatch onto a piece of white card stock. Laminate the cards so they will last. When it’s time go partner students, mix up the stack and hand out the cards. 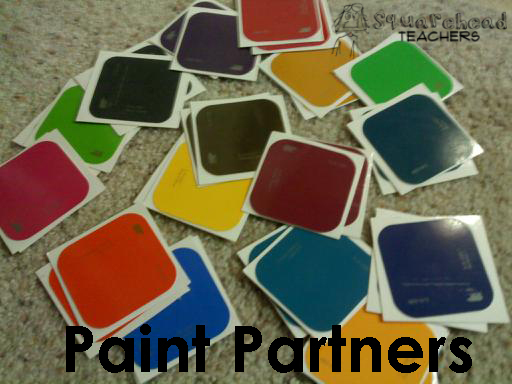 Give your kids a set amount of time (I used 1 minute) to find and sit next to their paint partner (the other student who has the same paint swatch as them). Note: this idea requires time to let kids find their partner. I found this was a quick, effective break before introducing the new assignment. This entry was posted in Management and tagged Children, classroom management, Education, Elementary School, Kids, Management, student mixer, Teacher Resources, Teachers, Teaching by Squarehead Teachers. Bookmark the permalink.